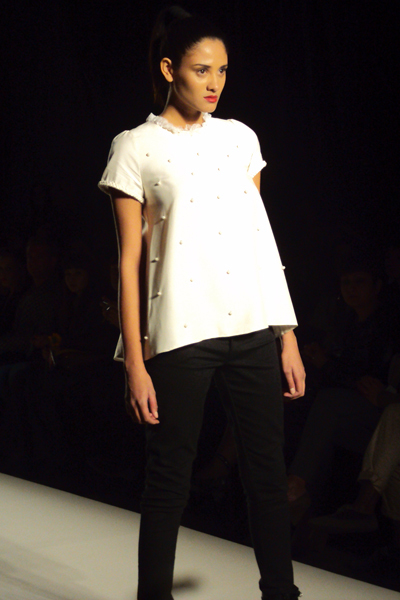 Corina Vladescu is a 26-year-old Romanian-born fashion designer. Graduating from the National University of Bucharest with a Master in fashion and having her entire diploma collection bought, she decided to create he own signature brand in 2008. She has also produced costumes for Tsaikovsky's Swan Lake at the National Opera of Bucharest, designed stage costumes for Roisin Murphy and has even worked as a fashion assistant for Madonna! Pop stars aside, her AW2010/11 collection that was presented last Friday during Fashion Week Athens was definitely one of the best this season. Black paired with whites, nudes and khakis consist very chic yet wearable outfits. My personal favourite of her collection is this utterly chic coat above. I don't even know where to start. 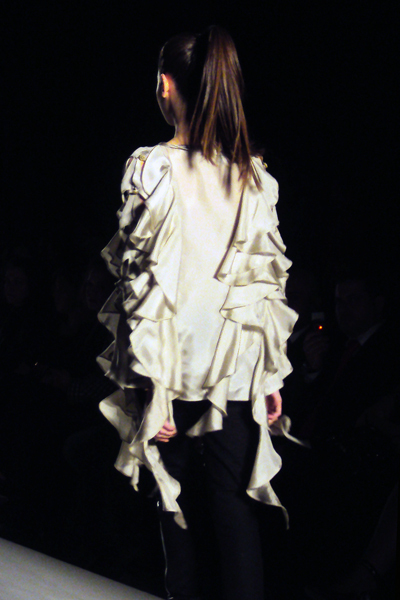 The amazing shoulder pleat detail? The perfect cream colour? 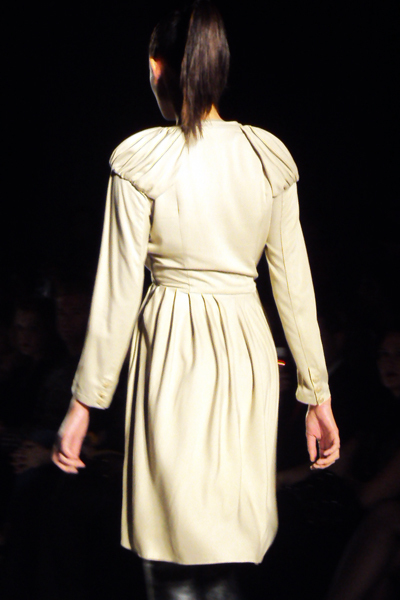 The discreet pleats on the subtly defined waist? I just can't get over it. Her official website seems to be under construction, but clicking on the image you get re-directed to her blog, where you can also find her facebook page. Consider yourselves linked. All pictures in this post were shot by me. Love finding new (to me) designers. The dots on that first top and its cut = lovely. Wow, I love the structure of these pieces, especially the second one!